When I was a kid growing up in the 1990's, I was a huge Sandler fan. He had just come off of the heels of his SNL days, and those are days I will always cherish. He was a wonderful performer on that show and he went on to make some pretty good movies. I love "Billy Madison," and "Happy Gilmore" and "Big Daddy." He even had a pretty good career well into the early 2000's. His flaws were starting to show by then, and sadly it was those flaws that became hallmarks for his career in the future and not the exception. He got disgusting, he got overly-outrageous, he played it safe instead of being the risk taker he was after SNL. Much like Eddie Murphy, Adam Sandler just decided to stop being Adam Sandler. With this four movie Netflix deal he's got going, there seems to be a whisper of life. Not a massive breathe, but a whisper. 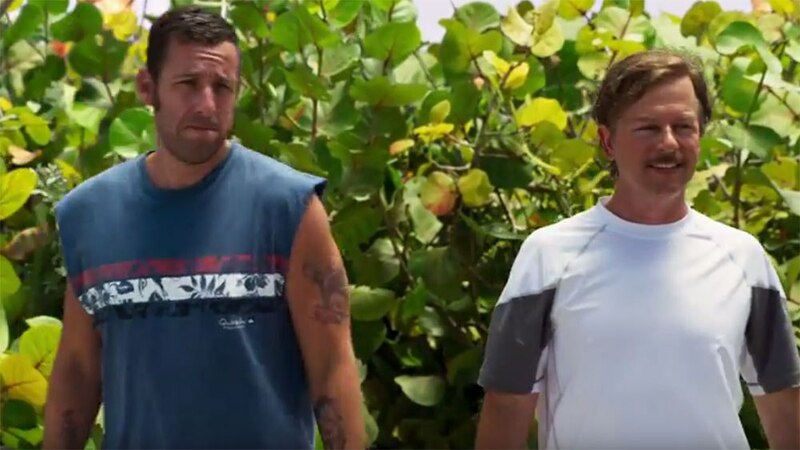 It seems like Adam Sandler is trying to be the guy he was in the 1990's, and that shows in "The Do-Over," this year's Adam Sandler Netflix offering. It a better movie than "The Ridiculous 6" was, which was Sandler's first Netflix movie. But even in the end of the "Do-Over," the new Adam Sandler that we know shines through. For shame, because "The Do-Over" had a pretty decent premise. Charlie (David Spade) is a guy who brings "down on his luck" to a whole new meaning. His wife cheats on him in his own house in front of him. His children disrespect him and even bully him and he manages a bank inside a grocery store, but is treated more as a grocery store clerk than a bank manager. At a recent high school reunion, he runs into an old friend named Max (Sandler). Max has become an FBI agent and he wants to start hanging out with his old high school buddy once more. Max convinces Charlie to take a man trip down to Puerto Rico with him and the guys have a great time together. That is until Max blows up their boat and tells Charlie that they faked their deaths and stole two dead men identities. It turns out Max isn't an FBI agent, but a coroner and he felt bad for Charlie's misgivings and wanted to give him a second chance. Charlie is reluctant at first, but then decides to live it up with his best friend in Puerto Rico with new identities, which gives them lots of leisure. Like I said, I think its a great idea. Its something that could possibly be ripe for comedy. It feels like a warped version of a "Weekend At Bernie's" riff. The thing that is shocking is that despite starring Sandler and Spade and featuring supporting work from Nick Swanson, Paula Patton, Catherine Bell and Matt Walsh, very little of the movie is funny. The film is more of a whodunit? mystery and it pushes through its story solving the mystery, barely stopping to breathe. Sure, there are chuckle moments here and there, but its rather remarkable how unfunny this "comedy" truly is. In the right hands, a whodunit mystery can be good fun and can be used for some big laughs, Sandler and co move past most of it. Also, this is probably the most confusing comedy I have seen in a long while, and its a movie that unnecessarily confusing. First Max is an FBI agent, then he's a coroner and then he's a guidance counselor who went to the police academy? Its one weird character revelation after another, and it just gets exhausting after awhile. The story itself gets equally exhausting. What could have been a good movie of two goofballs stealing identities they shouldn't have to improve their lives is a fun idea by itself, but then it turns out they are getting shot at, then they meet a woman in on the conspiracy, then it turns into some kind of business cover-up and after awhile I start to wonder why any of this matters? Why is the story line constantly shifting? Also, if there is so much story to tell, who is Sandler trying so hard to bulldoze through so much of it? Sandler and Spade and everyone who comes to play with them (look for Sean "Samwise Gamgee" Astin in a completely unrecognizable role.) are all very good. They even squeeze a laugh out here and there, but overall "The Do-Over" is not funny. Its also confused by what it wants to be as a story, and that is what is most frustrating about it. Something like "The Do-Over" gets my goat worse than "Grown Ups" or "Jack and Jill" or "Zookeeper" or "Just Go With It" because its clear Sandler didn't care. With "The Do-Over," it seems like some genuine thought went into this. Sandler is back in his tougher, R-rated comedy here and it could have been magnificent, but then he chickens out completely. I am still hoping someday Sandler goes back to why we loved him so much in the first place, unfortunately its not here. Third time's the charm with his Netflix endeavor though, right?